Reduces Strain on Fingers - The highly repetitive action associated with mouse clicking can greatly increase finger fatigue and the risk of developing joint pain, especially for those who use non-ergonomic mice. A footswitch addresses these concerns by transfering mouse-clicking actions from the fingers to the foot. Reduces the Potential for Trigger Finger - "Hovering" a finger over a mouse button in anticipation of the next click can lead to the development of a condition known as "Trigger Finger." By transferring the left click--the most common mouse action--to a footswitch, the user can significantly reduce the risk of developing this problem. Transferring the left click to the footswitch also allows the entire hand to relax more completely, which may lead to better cursor control. Reduces Awkward Reaching - Hands and fingers can be overstressed by constantly performing awkward combination keystrokes or by straining to reach a key on the outer edges of the keyboard. 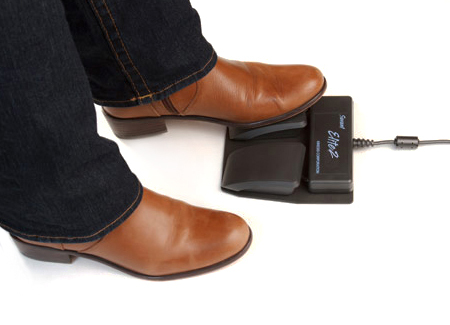 By programming a footswitch to perform the same functions with a single press of the pedal, users can give their fingers and hands a rest while at the same time potentially increasing productivity. Comfortable Switch Positioning - All Savant Elite2 footswitch control modules with extra input jacks allow the accessory footswitch(es) to be positioned far away from the control module for optimal access by both feet. Pre-Programmed Default Actions: All Savant Elite2 footswitches come pre-programmed to activate right and left mouse clicks. For many users the pain associated with mousing is from the action of clicking, not from moving the mouse. The Savant Elite2 resolves this problem by relocating the clicking action to the foot. Driverless Programming: The Savant Elite2 line of footswitches can now be programmed using the convenient preinstalled SmartSet App visual interface. This App offers an intuitive interface for quick programming of all functions available on a given devices. Since the SmartSet App loads directly from the device there is no need to install a driver or programming software. Both Windows (7, 8 & 10) and MAC (OS 10.5 and newer) versions are preloaded on new pedals. Users of earlier Savant Elite2 Footswitch products with serial numbers lower than 30000 require this earlier version of the SmartSet APP. Users of earlier versions of the Windows or MAC operating systems, or of alternative OS such as Linux, Android or Chrome are still able to fully program the footswitches by editing a simple text file. An Explorer window displaying the Foot Pedal as a flash drive (identified as: Kinesis FP) is automatically loaded to the computer when the unit is put into programming mode. The pedals.txt file stored here can be edited to perform the desired keyboard or mouse action, and then saved to the unit. In addition, multiple files can be created for specific uses, and programming files created on any system can be saved to the foot pedal flash drive. Download the Savant Elite2 Manual for detailed instructions on how to program by this method. 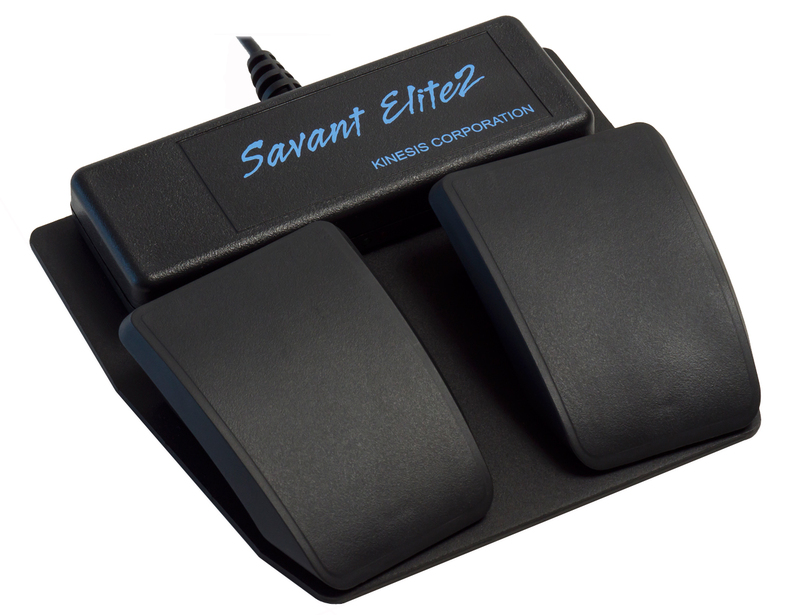 Double-Click Option: All Savant Elite2 footswitches now support the programming of a "Double Click" option. The triple action models (FP30A and FP30AJ) have the middle switch pre-programmed to perform this function. 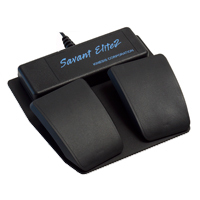 Programmable Keys or Mouse Actions: The Savant Elite2 line of foot pedals can be custom programmed to perform virtually any combination of mouse or keyboard actions, including even complex multi-key macros. Macro Programming: Macros are a great productivity tool for generating commonly used phrases, or combinations of key actions and modifiers. With a memory capacity of 1200 characters the Savant Elite2 will support the most complex macros. Adjustable Activation Force: All pedals on the Savant Elite2 line of footswitches feature an activation force adjustment which enables users to determine the level of resistance that works best for them. * Macintosh OS X notes: OS X doesn’t support middle mouse button without using a third party driver such as that found at www.usboverdrive.com. Also, modifier actions from one USB device cannot modify the input of a second USB device due to limitations designed into the Apple operating system (ie Shift, Control, Command, or Option keystrokes programmed into the foot pedal cannot modify the input of a separate USB keyboard or mouse. However, a key sequence like ‘Cmd-W’ or ‘Cmd-Shift-left arrow’ will work on a Macintosh if the entire sequence of keystrokes has been programmed into the foot pedal). Program the Footswitch to Your Needs - Determine which functions you need to program - then follow the detailed instructions in the programming guide PDF file which can be found in the Kinesis FP flash drive which is automatically loaded to the computer when the module is put into Programming Mode. Programming requires the editing of a simple text file. It is possible to create multiple files to address specific uses or circumstances. For convenience it is also possible to create files on a different computer and then transfer the file to the appropriate file folder on the host computer. Position Switches For Comfort - Position the Switch (or Switches) where your foot is relaxed and you are most comfortable. You want to be able to permit your foot to rest naturally on the pedal, not be reaching for it or needing to hold your foot "up" to keep it from activating the switch. 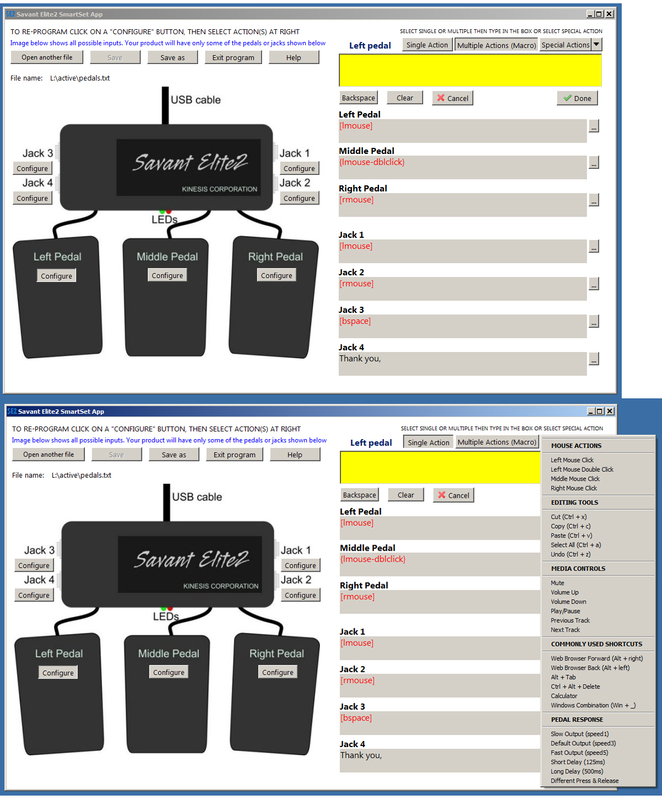 Adjust Footswitch Sensitivity - Each footswitch has a sensitivtiy adjustment for fine tuning to your specific needs. Ensure that there is a high enough resistance, so that you do not accidentally activate the pedals. If not you will find yourself trying to "hold" the weight of your foot which will be tiring at best or could lead to issues from the constant state of tension in the lower leg muscles. 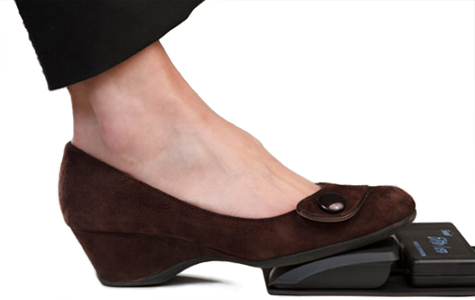 Work From a Seated Position - Foot pedals generally work best for users who are seated. Repeatedly activating a foot pedal while standing can be uncomfortable as the foot tends to be held in a state of extension which requires a constant tension of the lower leg muscles. This could be slightly mitigated by putting a raised support under the heel of the foot, raising the foot in relation to the pedal. This is not a recommended method of usage as it creates an imbalance that can result in other orthopedic issues. Watch for Symptoms of Overuse - With any repetitive action, there is a risk of developing Repetitive Strain Injuries (RSI). The feet are capable of heavy usage and do tend to have increased bloodflow which may reduce this risk. However, if a user suspects that discomfort is at all related to the usage of a footswitch it would be wise to reduce, or even temporarily suspend, this usage in order to help identify the source of the discomfort. As with any device, care should be taken to ensure that potentail issues are addressed as soon as symptoms become evident, rather than ignoring the symptoms and permitting an addressable concern to be elevated to a serious problem.